Vaporwave is the latest in a slew of offbeat genres that has successfully spawned off into the underground. At heart, it’s an interpolation of downtempo & chill out electronic music in which sci-fi-esque and throwback soul samples are incorporated into melodic and rhythmic structures. These productions seemingly contain hints of late 20th century nostalgia, and enough delay and reverberation to haze it up, or cause a vapor of sorts, to maintain the memory’s distance. Inside the movements core is a musician under the moniker Nyetscape. Known mostly through affiliations with the genre and his Tumblr page, this artist has crafted out two unique albums to the genre, even progressing them toward conservative Electronic styles and experimental Hip-Hop musings. Nyetscape started out under the stage name Chip Jewelry for his debut record, but changed it quickly to what it is today. What has resulted from this now self-titled debut is a series of thirteen quick tracks that flourish with pitch bends, tape manipulations, and loops. Quick cuts also make their way into Nyetscape’s sonic journey. “Belief is Natural” demonstrates all of these techniques, that seemingly find their way balanced and interestingly flow into one another, as part of mini-hyperized movements. The follow up, Nyetscape 2.0, expands on the foundations of the debut record by playing more as an auditory soundtrack than it does a record. Because of this, it’s difficult to describe the sound other than it’s unique approach to being highly visual. A creative Pink Floyd sample queues up near the five minute mark of Nyetscape 2.0, but it’d be hardly recognizable without listening intently for the signature, delayed slide guitar. It’s buried underneath layers of atmospheric ambience, sometimes borderline crumbling and adding to the somber vibe of the song. As it fades, a more abrasive track enters and the concept continues. The near end of this almost seventeen minute sophomore project highly demonstrates the crossover appeal Nyetscape has toward electronic music through the use of a few techniques. In the last three minutes of the record, an emotional segment in which a female vocalist is chopped, looped, and placed at the forefront of the song along side mild side-chain compression, glitch sounding offbeat percussion, and at a slower tempo shows the vulnerability inside the chaos. To say the least, the Nyetscape projects are extremely imaginative, psychedelic, and to definitely be experienced. Kavinsky influences are present and it’s difficult sometimes to not compare it to the attention MACINTOSH PLUS‘ Floral Shoppe gained in late 2011/early 2012 (but it is safe to say that the mixing and mastering on Nyetscape is far superior to the coarse mixing on the MACINTOSH project). However, the massive layers and density we’d see on a Boards of Canada project are astounding and references to the work of Kamas are unmistaken and embedded into the soul of Nyetscape. As a matter of fact, Nyetscape is no stranger to the alternative electronic music scene. Though only two releases are seemingly under his belt (with a third record called Nyetscape 3.0 slated for an April 20th, 2013 release), there’s even more great productions that leap more into the ambient and downtempo world under the alias of his last name: Kamas. In fact, there’s a great review of his 2012 release Cerulean on this blog here and “Child” from this record was named the number three song of 2012 here. Even more recently, a remix by Chris has been placed on the 2020k single for “Contagion” [bandcamp free download]. 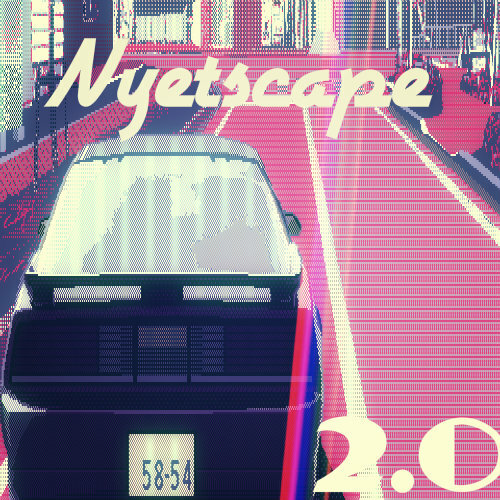 While Vaporwave, and many rogue sections of mainstream genres of music seem to be pinned as come-and-go thing of the moments, Nyetscape has certainly left his mark on two, soon to be three, wonderful pieces of instrumental storytelling. This entry was posted in Infrasound and tagged 2020k, Boards of Canada, Chip Jewelry, Christopher Kamas, Contagion, Contagion Single EP, Infrasound, Kamas, Kavinsky, Lo-Fi By Default, MACINTOSH PLUS, Nyetscape, Nyetscape 2.0, Nyetscape 3.0, Pink Floyd, Vaporwave. Bookmark the permalink.